← Views top 5,000! Thank you so much! One of my best friends from college got married this weekend. 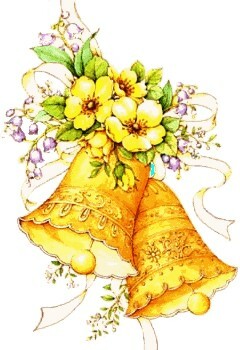 What a gift to see a couple so in love and so happy! As a wedding gift, we did some weeding and spruced up the planters in the couple’s front yard. 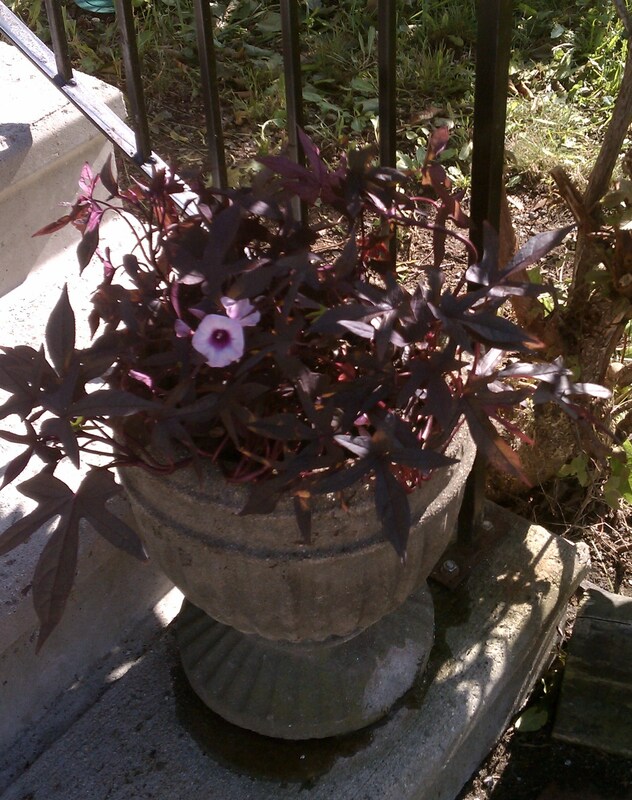 On the front stairway, the two gray urns received new soil, a healthy dose of plant food (we used Osmacote) and then we planted three beautiful, flowering purple sweet potato vines in each urn. Simple but striking. In the urns flanking a brown bench, we put in new soil, plant food and planted Golden globe arborvitae, with annuals Calibrachoa Noa “Blue Legend” and Sutera Cordata Scopia Gulliver White alternating in the front with English ivy around the sides and back. 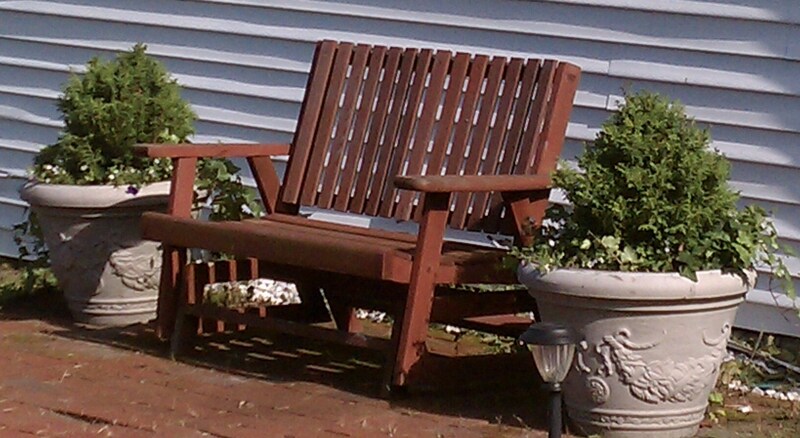 These plants – especially the arborvitae and ivy – will last a good long time, even with the intense afternoon sun. 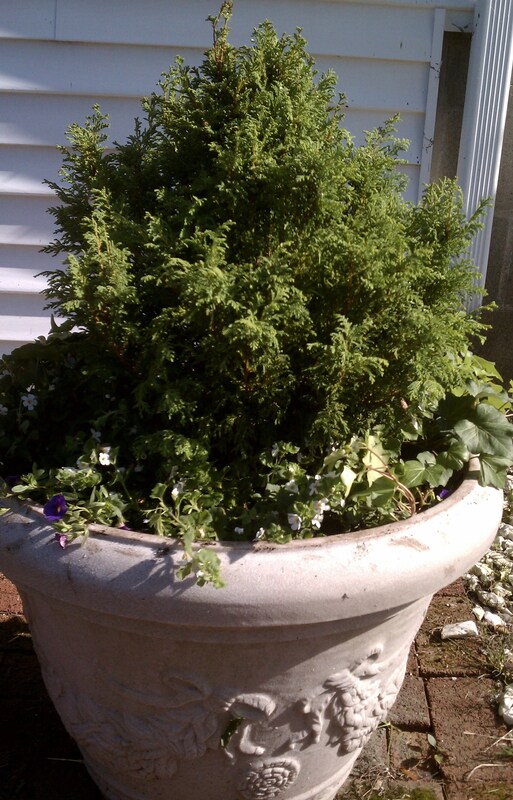 And let me put a plug in for arborvitae, an evergreen tree/shrub from the cypress family. Found throughout eastern Canada and Northeastern United States, the arborvitae has leaves that are soft to the touch, rather than prickly. Love that! Arborvitae prefer colder climates and will provide good color and show healthy branches all year long. This entry was posted in Flowers and Plants, Uncategorized. Bookmark the permalink. An all ’round amazingly written article!